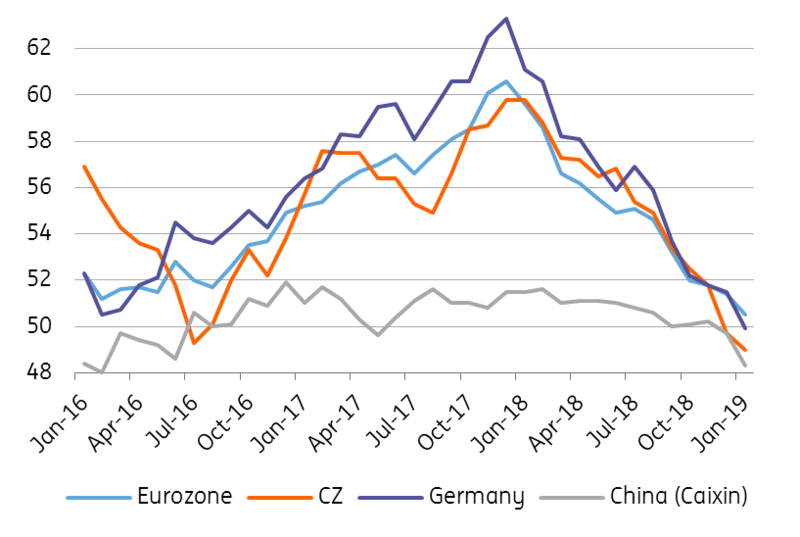 The Czech manufacturing PMI fell to a six-year low in January (the lowest since January 2013) and remained below the key 50 level, indicating that the sector is contracting. According to respondents, the volume of production and new orders declined in January. Also, for the first time since April 2013, some companies have reduced their staff, although the decline has only been negligible so far. The survey suggests that new orders in January have fallen due to weaker demand from key trading partners. Business confidence reached the lowest level in a year due to concerns about world trade and the impact of weaker demand from the automotive sector. Domestic PMI closely follows developments abroad and painted a similarly gloomy picture in January. The Manufacturing PMI in Germany declined to 49.7, also the lowest level in six years. The decline was mainly related to the lower volume of new orders due to weaker demand from international markets. Sales fell to the US, UK, Italy, Turkey and China, where recent PMIs also remain under the 50-point mark, see China’s Caixin PMI plunges. PMI leading indicators signal a weaker outlook, not just for the domestic economy. While there is still some speculation about the extent to which the weakness has come from new emission standards in the European automotive sector, it's becoming increasingly clear that recent weaker figures are not just about one-off factors. This means that next week's CNB monetary policy meeting will be much less about the domestic economy itself. Indeed, less favourable prospects for the global economic outlook require a more prudent approach to monetary policy, something that a few board members have also signalled recently. Given all of this, we expect an 'on hold' decision next week.